Last week I came home from work and walked into the bedroom to grab my iPad. Something out the window caught my eye. It was a movement I saw out of the corner of my eye, but at that point wasn’t sure what it was. I waited a minute. 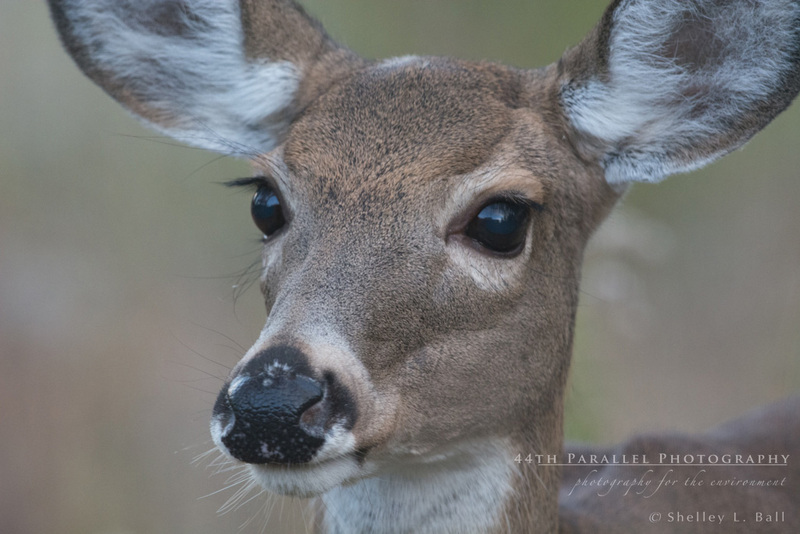 Out from behind the big ‘lump’ in our backyard (that’s the name I give to our pile of dirt that’s now covered with a million weeds rather than gracing our flower beds…) walked a beautiful doe – a White-tailed Deer. 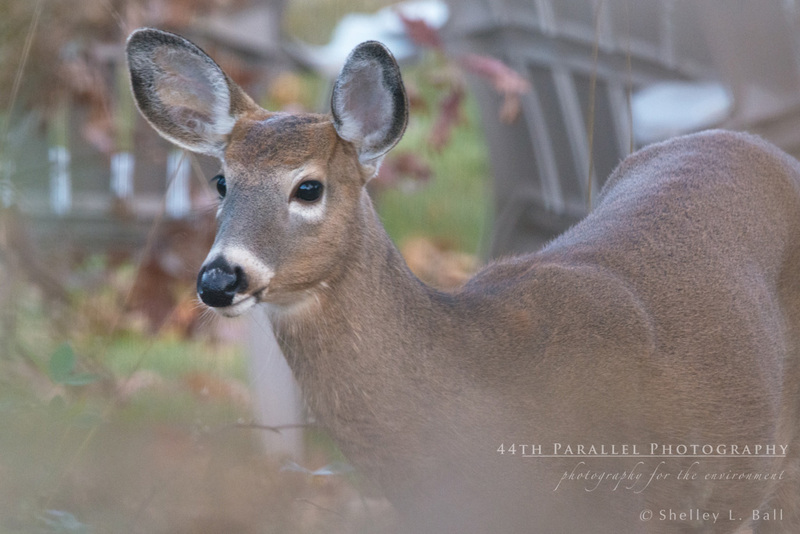 She lazily grazed her way across our backyard, nibbling on grass and twigs. I was enjoying just watching her, when I saw more movement. 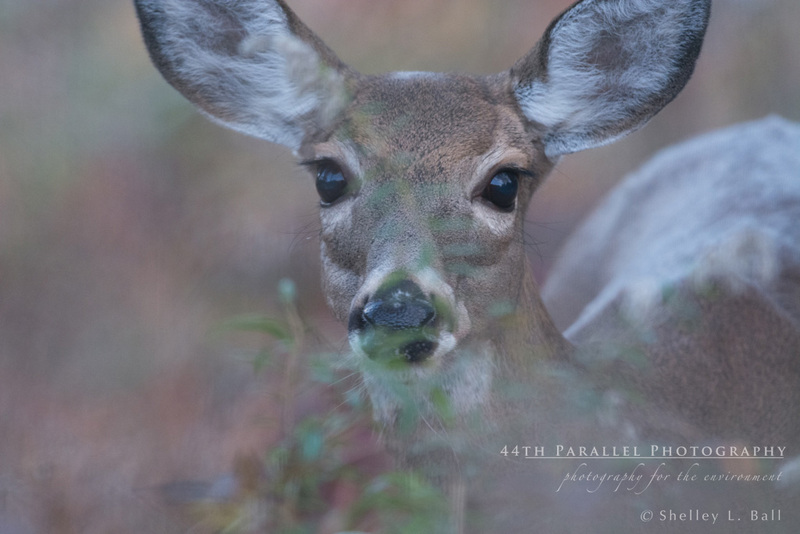 This time, her fawn came wandering out from behind the ‘lump’. She wandered over to Mum, who then began to lick her face. Wow… what a moment. The nature-lover in me was just soaking up this sight. But then the photographer in me said “quick, grab the camera!” And so I ran upstairs and grabbed my D7100, which thankfully was already attached to my 600 mm lens and on my tripod. I carefully made my way down the stairs and slowly walked into the bedroom. It was clear that there was a snowball’s chance in hell of going outside and getting photos out there. One crack of a twig and Mum and fawn would be gone. So, the alternative was to shoot photos through the window. It’s times like this I lament that I’m not better at keeping our windows clean. But hey, when opportunity knocks…. The problem with shooting through the window wasn’t the glass. 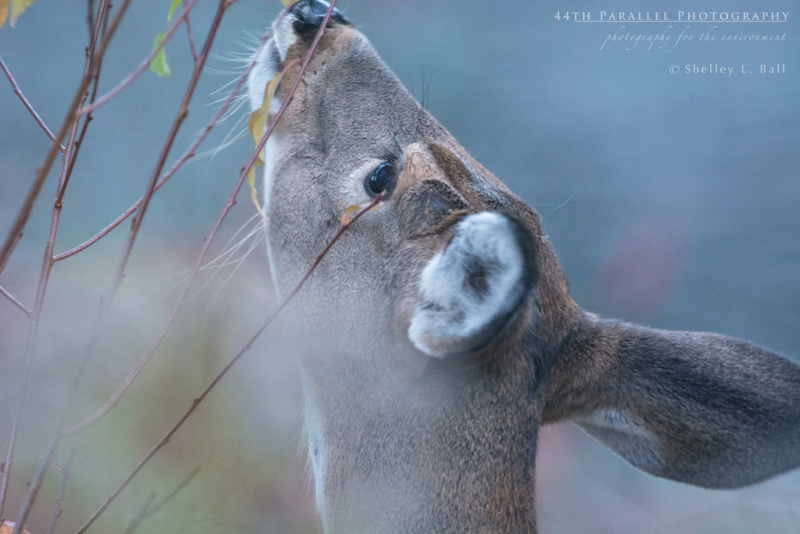 It was the patch of rather tall, dying goldenrod plants right behind our window. Lovely as they are in late summer, right now they were annoying. 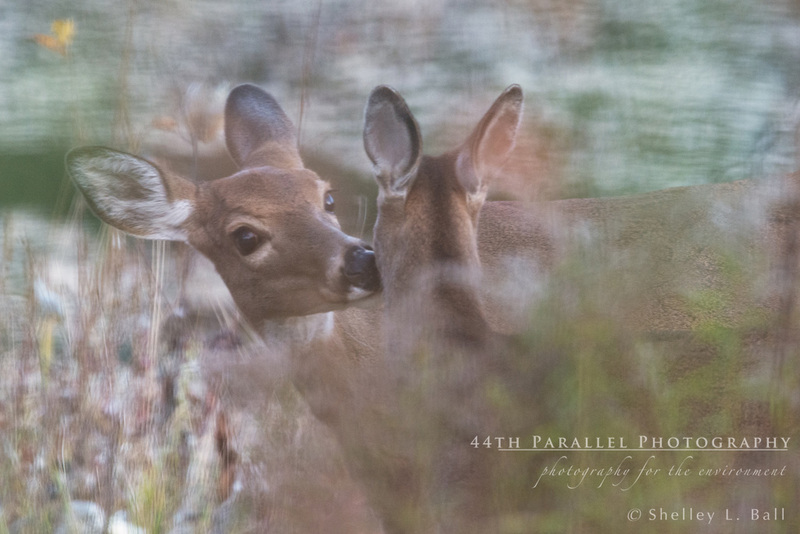 I could get glimpses of Mum and her fawn through the weeds, but that was it. It was clear that if I was going to shoot from inside, I needed to be up higher. Given that I’m only 5 foot 2 (and that’s on a good day), this was a problem. But I quickly remembered the step stool we have in our kitchen. So I ran out and grabbed it. Better. I was up higher. But I couldn’t get my lens at the right angle to get at least partly above some of the goldenrods and find open patches big enough to shoot through, if the deer wandered that way. It was worth the effort. 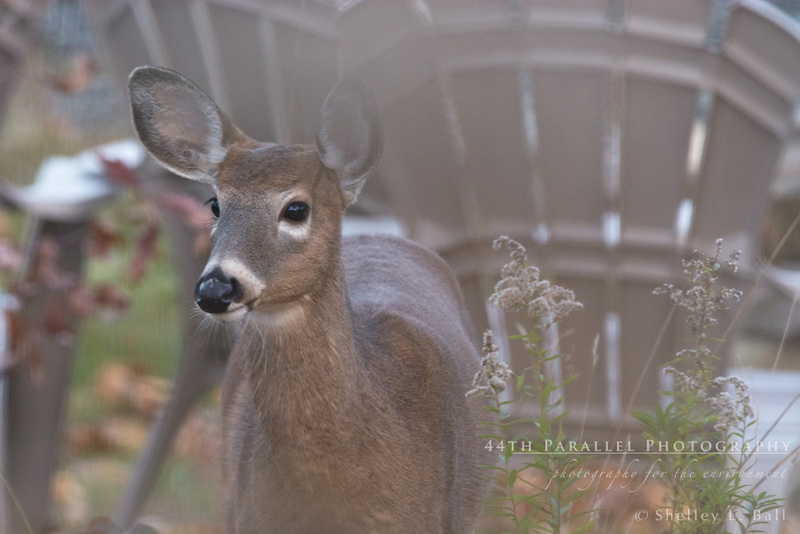 Mum and fawn didn’t see me and so I was treated to 20 minutes of them wandering through our backyard. At one point Mum was probably 16 feet away from the back window. If she’d come any closer, she’d be too close to the minimum focusing range of my 600 mm lens. The absolute icing on the cake, was watching Mum spend a few minutes licking her fawns face. It was reminiscent of childhood, when my face was covered with tomato sauce from my lunch of Alpha-getti and Mum rather roughly cleaned me up using a face cloth. 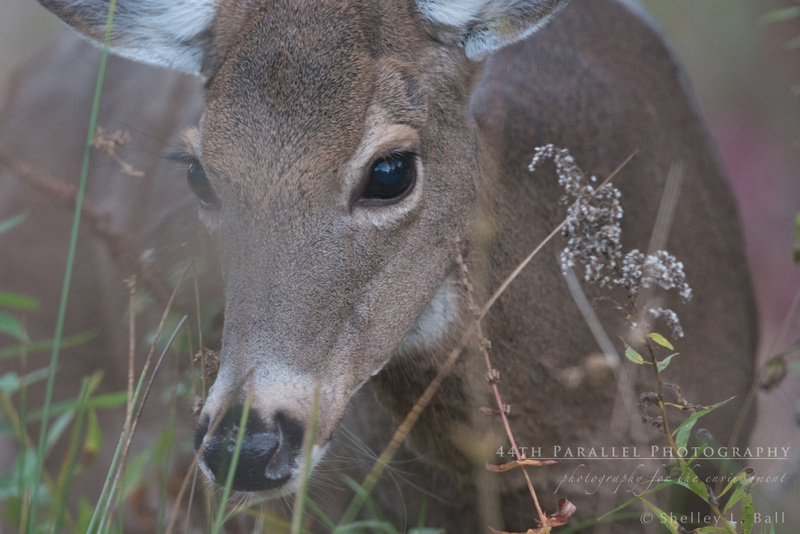 I’m sure this fawn was having the same experience because you could see her fuss and move her face away. I’m sure Mum was telling her to stay still…. Below is a series of images I made of these moments. 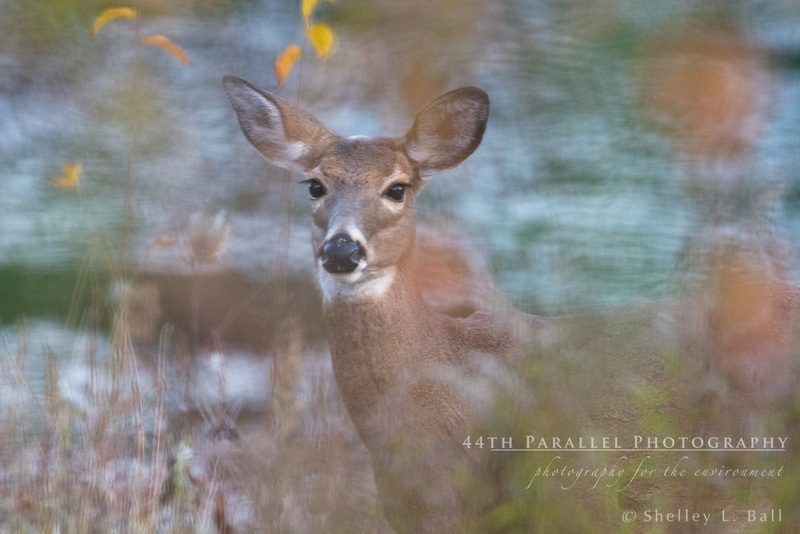 What I love about these images is that in most cases, I was forced to shoot through the patch of dead goldenrods outside the window. When you shoot ‘through’ something that is close enough, it has the effect of creating a hazy patch in your image. It’s like your shooting through a lens smeared with Vaseline, depending on how close the thing is that you are shooting through. Sometimes it creates light blobs that are nothing but distractions and which ruin the image. But sometimes it helps to create a wonderful softness to the image, as if you used a filter. None of these images have had anything done to them, other than a teeny bit of cropping on a few and some basic tweaks such as a slight bump in vibrance, brightness, contrast and colour temperature, where needed. Mum caught a quick glimpse of me but not enough to frighten her off. I was camouflaged behind those tall goldenrods. Shooting through the dead goldenrod seed heads created this soft, blurred effects. Sometimes you get lucky in that the animal manages to position themselves in a way that the entire scene isn’t blurred and as in this case, there are a few brightly coloured leaves to help frame the image. Mum and her fawn have their moment together. 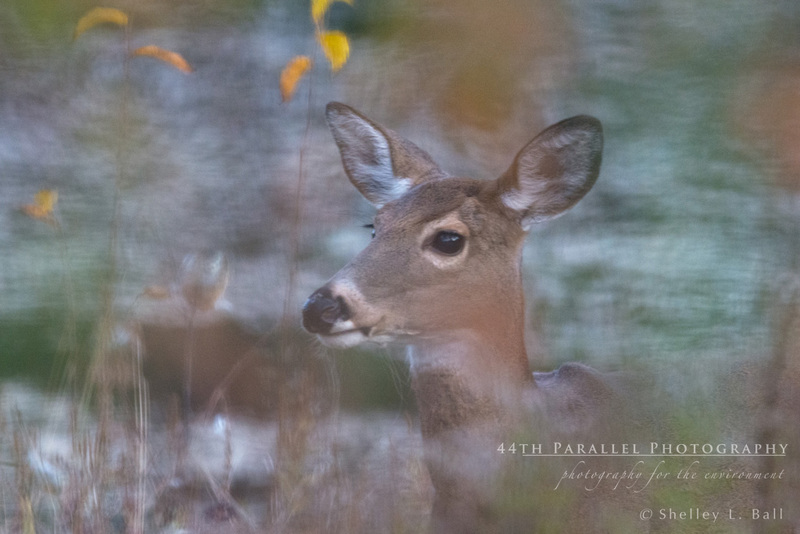 As Mum moved closer, it was possible to get a few clearer shots with fewer goldenrods to shoot through. What a treat to have this doe about 16 feet from my window. Mum was so close that with my 600 mm lens, I couldn’t get her entire head in the frame.